Not half as good as a real gas or charcoal grill, but considering most apartment complexes won’t allow those on high-rise balconies, this is the best you’re gonna get. I mentioned before that I got an electric patio grill for my birthday earlier this month, and based on some reviews on Amazon, I deviated slightly from the assembly instructions that came with it. Specifically, I added a little mass. Reviewers on Amazon mentioned that the grill just doesn’t get up to any real temperature. So, underneath the heating element, I added a round wire rack and a layer of lava rocks designed to be used with a gas grill. The real payoff with this mod is that the more I use the grill, and the more food juices fall and stick to the lava rocks, the more smoke. And smoke is what gives flavor. I’ve been pretty happy with this, even though it’s just a glorified electric broiler element in an enameled steel encasement. It gets plenty hot — easily climbing to 500° — and it does it pretty quickly. It did blow the electric circuit when I tried plugging it in on one of the more heavily used circuits in my apartment. It costs about $200 with shipping (though Amazon will ship it for free if you’re willing to wait a couple extra days), and it’s fairly easy to assemble with a screwdriver and a crescent wrench. Although I can’t say if it will last many, many seasons. If it lasts two or three, I’ll be satisfied. 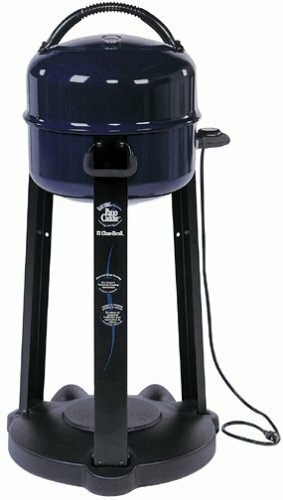 Amazon : Char-Broil Patio Caddie Electric Grill, $159. This method cuts the normal cooking time for a chicken in half. I got an electric patio grill for my birthday a few weeks ago, and with a few modifications, it’s able to get really very hot. So now I can grill food, legally, on my high-rise balcony with no worries about setting off the smoke alarm. And tonight I made butterflied BBQ’d chicken and it turned out really well. But if you don’t have an electric grill, it will work fine under the broiler of your oven, and even better if you have access to a gas or charcoal grill (though you’ll probably have to fidget with the cooking times). You’ll need a chicken, no more than 4 pounds, preferably 3. Cut the back bone out, and cut off the wing tips, and splay it out on the cutting board, legs akimbo, skin side up. Take a kebab skewer and press it into one of the shoulders, and run it diagonally through the breast, and aim the tip to come out the end of the opposite drumstick. Take another skewer and make an X, starting in the other shoulder. This will keep the bird from curling up over the heat. Now you can flavor the chicken with whatever spice combination you want. I chose a mixture of bbq seasoning, salt, garlic powder, and pepper. I mixed a little of this spice combination with some softened butter and crushed fresh garlic, and inserted it under the skin over the breast and down to the thighs and leg. Then I covered the bird, front and back with the dry seasoning. Cooking it can’t be easier. Once the thermometer on my grill was up over 425°, I sprayed the grill with a little canola spray, and put the bird, skin-side down, onto the grill and put on the cover, and cooked it that way for 15 minutes. I kept my eye on the thermometer and regulated the heat so it stayed roughly around 400°. Then I turned it over, and cooked it, skin side up, for 25 minutes, rubbing bottled bbq sauce on the chicken in the last 5 minutes. 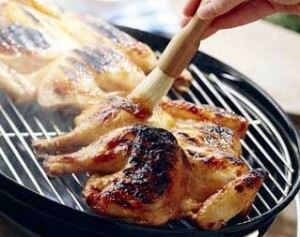 You want the chicken’s internal temperature to be 165° at the thickest part of the thigh. The juices should run clear when you cut into the bird on the platter. Stores are selling peaches at a cut-rate price now. Sweet and juicy, now’s the time to think about canning some so you can have that flavor all autumn and winter, too. Look for the best you can find … firm, but that have a fragrance. Even if they’re a little under-ripe, they’ll ripen at home, unmolested by squeezy shoppers. (One firm squeeze is enough to bruise them.) To ripen at home, place your peaches in a paper sack with a couple of ripe bananas. These will exude ethylene gas, which triggers the peaches to ripen even more quickly than they normally would. Ripening can happen in as little as 12 hours, so buy enough so you can keep tasting one to test for sweetness. I wouldn’t start with anything less than 10lbs of peaches, since it’s not worth the trouble to work with any less. And resist the temptation to use nectarines.. even though most people dislike the furry skin of a peach — we’ll be skinning them — nectarine flesh tends to stick hard onto the pit. Wash the canning jars in the dishwasher, turning on all the features to make it the hottest, sterilizing wash you can manage. Don’t wash the lids with the little rubber rings, though. The heat will compromise their integrity, and could give you a bad seal. Instead, wash these in hot water with some bleach in it, then rinse them thoroughly. To prepare your peaches, boil a large pot of water, and have a bowl of ice water handy. I worked in batches of 6 at a time, but if you’re working with help, you can set up a regular assembly line. Cut an X in the bottom of each peach, just enough to cut through the skin, as you drop it gently into the boiling water, and let them heat up for about 30 seconds. Remove them all to the ice water bath. The skin should satisfyingly peel off. (If at all resistant, just dunk it back into the hot water for a little longer, then into the ice water again.) You can try to cut the peaches into halves, or even the neat little sections you see in industrial canned peaches, but I found it easier to just cut them randomly, in mouth sized pieces, discarding the pit, and any bruised or brown parts — keeping a sharp eye out for any tooth-breaking bits they sometimes leave behind. Toss the cut segments with Fruit Fresh (powdered vitamin C) or lemon juice to prevent oxidation. Repeat these steps until you’ve processed all of your peaches. Now, prepare your syrup mixture. I went with a mixture of apple juice and a little Splenda, and some spices (cinnamon and star anise). I found that one gallon (64 oz.) of juice is enough to fill 12 pint jars mostly full of peach segments. I used three small sticks of cinammon, and 2 whole star anise. Pick good quality apple juice, preferably with the least amount of additives and no sugar added. I used ¾ c of Splenda for a gallon of apple juice, but you can increase or decrease that, depending on the sweetness of your peaches. Heat this to a gentle boil. 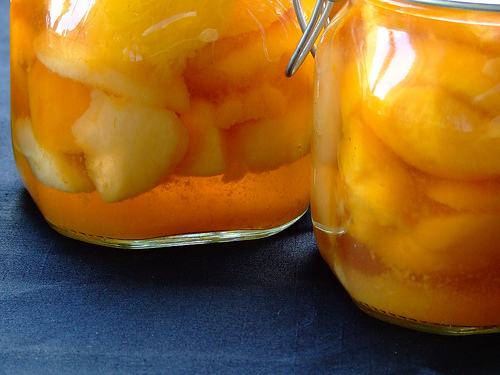 Spoon the peaches into the sterilized jars, leaving a little space at the top. Then ladle the hot apple juice in, covering the top, but leaving a little headroom. Cover and attach the screwtop rings to finger tight. Once you’ve gotten this far, you can rest for a little while. Put your biggest pot on to boil, with enough water to immerse your jars with an inch of water over them. When the water is at a full boil, carefully lower your jars into the hot water, and let them boil for at least 20 minutes — longer if you live at altitude. Then remove the jars and allow them to cool. In 24 hours, remove the screwtop rings, and check the seal. If any aren’t solid, set those jars aside, and eat them within a week, storing them in the fridge. As for the rest, keep them in a cool, dark area, away from heat sources, for up to 12 months. When you go to eat them later down the road, inspect them carefully when you open them. Any that have obvious signs of decay — mold, smell, etc. — discard immediately. FreshPreserving.com — the public website of Ball jars and canning supplies, in the business since 1884. PickYourOwn.org — has a great guide, including charts for making different kinds of syrup mixtures, as well as boiling times for the last canning step, depending on altitude. Monterey Bay Aquarium provides an excellent list of which fish and seafood to buy and which to skip. It’s fully hyperlinked, so you’ll find out why you should avoid a particular fish. Orange Roughy, for example, is a fish I’ve bought and wrote here about in the last few months, but I had no idea it was on the avoid list… (due to its slow reproductive rate and potentially high mercury content). I was also surprised to see Atlantic cod on the list (due to overfishing). You can view the list by region (US only), and you can print the list out, and make informed decisions next time you’re at the market. Last week, the good people at La Cense Beef sent me a quantity of their products to try for free in the hopes I’d tell you good things about them here. And after trying some of the items they sent, I am certainly impressed. Their website proclaims that their beef is all natural, hormone free, grass fed beef. The product comes in a styrofoam cooler, deep frozen with a block of dry ice to keep it that way. After allowing them the thaw, my wife and I have sampled two of the items they sent — their steak burgers, and their NY strip steak. The hamburgers were fine, though not anything really to write about, but their strip steak was delicious. Strip steak is my favorite cut when I make steak. I usually go for the thick steaks that sell at Whole Foods for similar price, per pound, as La Cense, but they’re cut much thicker, and require a bit more care to cook. The La Cense strip steak was about three-quarters of an inch thick. It arrives in a vacuum package, so the steak was a little misshapen when I removed it from the packaging. (Somehow, during shipping, the packaging on this steak had developed a small hole, so it left a bit of a bloody mess in my refrigerator as it thawed. You’d do well to thaw your steak in some sort of a tray or zip top bag to avoid a similar fate.) The steak displayed a good amount of fat and marbling, and the flesh was deep red. After cooking the steak in the usual way (warming on the counter for 30 minutes to take the refrigerator’s chill off, drying the surface with paper towel, and then generously sprinkling with salt and fresh ground black pepper, I cooked the steak in a hot skillet for 3 minutes per side, putting a lid on the pan for the last 2 minutes of the second side, to cut down on the smoke, and to push the heat deeper into the steak. I then allowed the steak to rest for 10 minutes.) My wife proclaims that this is one of the best steaks I’ve ever made, better than the dry-aged steaks from Whole Foods. Since I’m suffering from a head cold, I will have to take her word for it. I thought it fared better than a similar cut from the normal grocery store, but wasn’t quite up to par when compared to Whole Foods. Add to that the inconvenience of having to thaw the steak for several days puts it slightly lower in my book. However, if I had ample freezer space (which I don’t), I wouldn’t hesitate to order several of these steaks to keep on hand. In a food processor, get the blades going, and drop in the garlic until it’s finely chopped. Add the chick peas, lemon juice, tahini, adobo, salt and pepper, and blend, adding the reserved chick pea liquid until a smooth paste is formed, scraping down the sides. Transfer to a serving bowl, drizzle with olive oil and smoked paprika, and serve with crudite and/or pita bread. Option 1 : Roast some fresh hot peppers over a flame, and put into a plastic bag to steam for 10 minutes, or when cool enough to handle. Remove burnt skin, and slice open to remove seeds. Add the remaining flesh after you’ve chopped the garlic.